These look great! I made a taco spice blend that turned out very good. I got it off of recipezaar, I think. Mmmmm. These look delicious! I have heard you can fry a corn tortilla to make shells. I haven’t been brave enough to attempt it yet though. Theses look wonderful. We love tacos in our house. Love tacos! In fact, I prefer the hard shell. Like you, I will admit that I also use the taco seasoning packet. Looks like you made the leap to spicing up your ground beef with a variety of spices. I need to make that leap too. By the way, I have been taking lots of photos here in Holland. Looking forward to updating my blog when I get home. There is so much that I want to write about! Oh wow, I am definitely craving one of these. Who can resist a luscious beef taco. YUM! Yum! I love using pan fried corn tortillas for tacos, too. SO tasty! Ever try using Chipotle Chilis in Adobo sauce in your filling? I don’t ever remember seeing it before I moved to Wichita. Oh man it’s good stuff. Smokey and spicy. Yum! Karen – I have thought about using chipotle…but was worried it would be too chipotle-ey. I will definitely try this next time around though. I always have a can in the pantry, and usually leftovers from the previous can in the freezer. It is really good stuff! I love that you made your own seasoning. Great picture too. Yay for making your own spice mix! 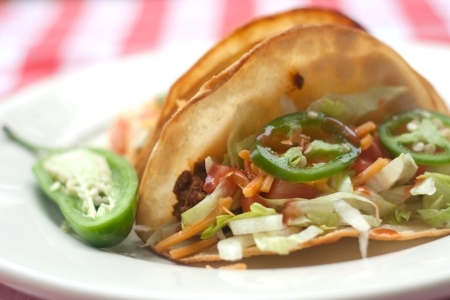 These look amazing…tacos are a total comfort food for me. I always find salt content amazing too especially because if I included that much salt in my recipes they would be inedible…they must do something to disguise it. I agree about that little yellow spice packet, but I admit I sometimes grab it in a pinch. I’m loving the look of your tortillas! Wow, they are perfect. OMG, I love your blog and I love that you fried the flour tortillas. I too, always wonder why so much sodium has to be packed into small amounts of food. My body sure can’t take it without rebellion! It is shocking isn’t that they can pack so much sodium into most processed foods. I much prefer your version here. It sounds fresh and delicious. Have a good new year!